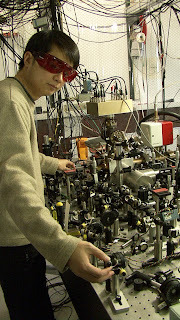 In a paper published in the Feb 17th issue of Physical Review Letters , a team of physicists from National Institute of Standards and Technology (NIST) reported the successful development of the world’s most precise clock -- an enhanced version of an experimental atomic clock based on a single aluminum atom . The new clock is more than twice as precise as the previous pacesetter based on a mercury atom . The new aluminum clock would neither gain nor lose one second in about 3.7 billion years, according to measurements reported in Physical Review Letters. The new clock is the second version of NIST’s “quantum logic clock”, so called because it borrows the logical processing used for atoms storing data in experimental quantum computing, another major focus of the same NIST research group. Logic is reasoning that determines an action or result based on which one of different possible options is received as input. 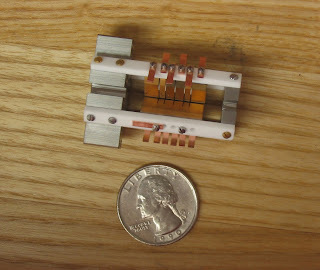 In the NIST clock, the input options are two different quantum states, or internal energy levels, of an aluminum ion. Information about this state is transferred to a beryllium ion, which, depending on the input, produces different signals that are easily detected. NIST scientists use lasers to cool the two ions which are held 4 thousandths of a millimeter apart in an electromagnetic trap. Aluminum is the larger of the two ions, while the beryllium emits light under the conditions of this experiment. Scientists hit the ions with pulses from a “clock laser” within a narrow frequency range. If the laser frequency is at the center of the frequency range, the precise “resonance frequency” of aluminum, this ion jumps to a higher energy level, or 1 in the binary language of computers. Otherwise, the ion remains in the lower energy state, or 0. If there is no change in the aluminum ion, then another laser pulse causes both ions to begin rocking side to side in unison because of their physical proximity and the interaction of their electrical charges. An additional laser pulse converts this motion into a change in the internal energy level of the beryllium ion. This pulse reverses the direction of the ion’s magnetic “spin,” and the beryllium goes dark, a signal that the aluminum remained in the 0 state. The goal is to tune the clock laser to the exact frequency that prompts the aluminum to jump from 0 to 1. The actual measurement of the ticking of the clock is provided not by the ions but rather by the clock laser’s precisely tuned center frequency, which is measured with a “frequency comb,” a tool for measuring very high optical frequencies, or colors of light. C.-W. Chou, D.B. Hume, J.C.J. Koelemeij, D.J. Wineland, and T. Rosenband, "Frequency Comparison of Two High-Accuracy Al+ Optical Clocks", Physical Review Letters, 104, 070802 (2010). Abstract. T. Rosenband, D.B. Hume, P.O. Schmidt, C.W. Chou, A. Brusch, L. Lorini, W.H. Oskay, R.E. Drullinger, T.M. Fortier, J.E. Stalnaker, S.A. Diddams, W.C. Swann, N.R. Newbury, W.M. Itano, D.J. Wineland, and J.C. Bergquist, "Frequency ratio of Al+ and Hg+ single-ion optical clocks; metrology at the 17th decimal place", Science, 319, 1808 (2008). Abstract. 2Physics Report. W.H. Oskay, S.A. Diddams, E.A. Donley, T.M. Fortier, T.P. Heavner, L. Hollberg, W.M. Itano, S.R. Jefferts, M.J. Jensen, K. Kim, F. Levi, T.E. Parker and J.C. Bergquist, "A single-atom optical clock with high accuracy. Physical Review Letters. July 14 (2006) Abstract. 2Physics Report.